As a turkey hunter, I am keenly aware of the threat posed by sneaking through the Alabama woods. And I’m not talking about the danger of encountering a member of the serpent family. I’m talking about something much, much smaller but possibly just as harmful. It’s the family of ticks that turkey hunters dread each spring, and the prevalence of disease-carrying ticks is becoming more evident each year. Emily Merritt, a research associate at Auburn University’s School of Forestry and Wildlife Sciences, has been working on a project, with funding assistance provided from the Wildlife and Sport Fish Restoration Program (Pittman-Robertson) through the Alabama Division of Wildlife and Freshwater Fisheries (WFF), since 2015 to determine the species of ticks in Alabama and their ranges. Merritt said a study on ticks and tick-related illnesses hadn’t been done since the early 1990s, and it was very limited in scope. The study that started in 2015 was to update and expand that research to include field collection sites for ticks. The most commonly collected ticks included the Lone Star tick, the Gulf Coast tick, the black-legged tick (aka deer tick) and the American dog tick. The Lone Star tick is the most common tick in Alabama and can transmit a host of diseases, including the alpha-gal red meat allergy, Southern rash disease (a Lyme-like illness), tick paralysis and spotted fever diseases that are closely related to Rocky Mountain spotted fever. A white dot in the middle of the tick’s back is the reason for the Lone Star name. Merritt said the Lone Star tick is found primarily in hardwood stands, while the Gulf Coast tick, which is a little larger and transmits similar diseases, is found primarily in more open areas with shrubs. The tick that has gained the most notoriety because of its association with Lyme disease is the black-legged tick. Merritt said the American dog tick also can transmit all the diseases associated with the other tick species. At one time, the Centers for Disease Control (CDC) insisted that Lyme disease was limited to the Northeast U.S., with a concentration of the disease around Lyme, Conn. In recent years, the presence of Lyme-like disease (Lyme borreliosis) has been acknowledged in Alabama. “Lyme disease refers to one specific bacteria,” Merritt said. “Lyme borreliosis indicates there is a host of similarly related bacteria that cause illness in Alabama. In fact, a graphic from ADPH shows that spotted fever-type illnesses have skyrocketed in recent years compared to the other tick-related illnesses. “People are getting sick from ticks down here,” Merritt said. “So it’s counterproductive for those agencies to say it’s rare. If you are an outdoors person your chances of coming in contact with these ticks is pretty decent. There is definitely a risk. One aspect of Merritt’s research includes a survey conducted through the Alabama Department of Conservation and Natural Resources. The survey was sent to hunters and anglers to ask about their experiences, knowledge of and costs associated with ticks and tick-borne illnesses. For those who spend time outdoors, Merritt said the project research found that the most effective deterrent for tick attachment is a spray that contains permethrin. “You don’t apply it to your skin,” Merritt said. “You spray it on your clothes, boots, hats, socks, backpacks, basically any fabric. When I go camping, I spray my tents and tarps with it. Depending on what brand you get, it will last anywhere from two weeks or two washings to six weeks and six washings. Although the likelihood of contact with ticks is higher during the warmer months, Merritt said the insects are active year-round in Alabama. “Be on the lookout, not only on pets, but your children, your loved ones and yourself,” she said. “If you go outside, there is the potential to come in contact with ticks. When you come back inside, check your clothes and gear immediately to see if there are any crawling ticks on you, your pets or children. Then take it a step further and check your body thoroughly for ticks. If you need to use a mirror or a partner, do that. Ticks can hide in all sorts of areas that are hard to see. If you do find a tick attached to your body, Merritt said don’t haphazardly try to remove the insect. 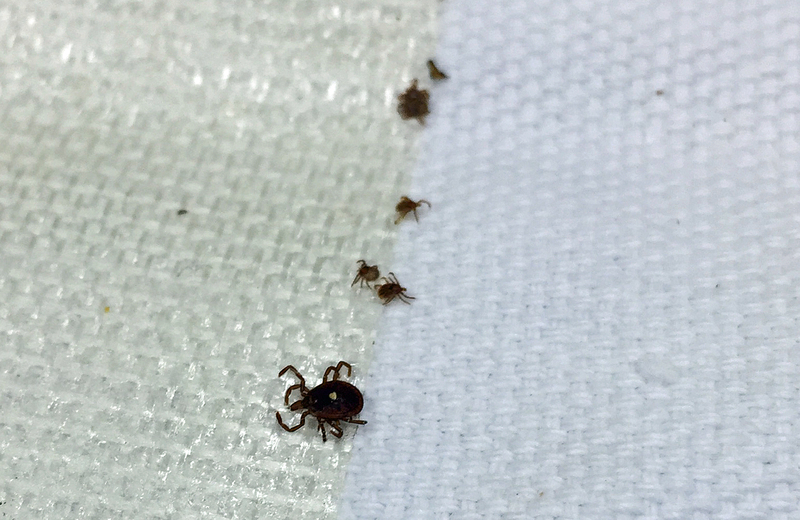 Merritt said tick-borne illnesses may cause symptoms as early as a couple of days, but symptoms could also occur as late as a couple of months after the exposure. Merritt said if the tick is found it can be saved for testing by taping it to an index card, placing it in a freezer bag and storing it in the freezer. For more information, go to www.aces.edu/pubs/docs/A/ANR-2315/ANR-2315.pdf or www.alabamalymedisease.org, the Alabama Lyme Disease Association’s website.